Hootsuite- Get a free account for up to three social accounts integrated. We recommend Instagram, Twitter and Linkedin. (You can schedule Facebook Posts inside Facebook. And share Instagram posts to Facebook from Instagram). So you do not need to add it into your Hootsuite account. You will want to also download the Hootsuite Google Chrome Extension (as shown) and download the Hootsuite app on your mobile device. Click down to the Autoschedule in your options and set up your message count, hours and days for content autoschedule. You can click through the Notifications, Preferences and Account tabs to customize the system further. 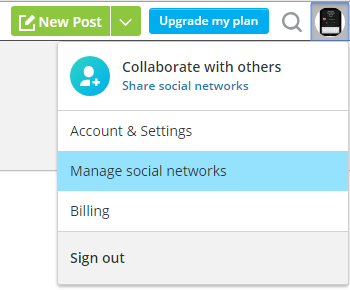 Once you have your settings established, you can click back on profile image in top right of main dashboard screen & click on "Manage social networks"
Click on the "Private Network" button to open up a dialog box to choose social media accounts and connect the ones you want to share to.